The kennel pictured, is for a large dog, and measures approximately 1.3m from front to back, 1.1m high, and 1.1m wide. There is also aoption for a medium size dog , collie ect. I can also make a small kennel for smaller dogs , please enquire. The kennel is delivered in very few, easy to assemble, components with clear assembly instructions. 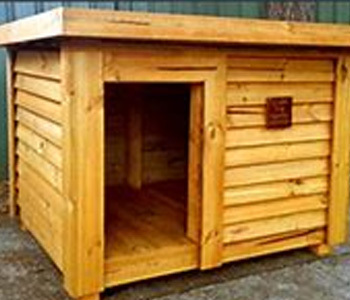 kennels are made with green pressure treated shiplap , so may differ from picture colour.